The client virtualization software market has started to enter the maturity phase, and many vendors, through acquisitions, have started to expand their capabilities into physical desktop management, mobile enterprise application management, and SaaS application management. As vendors continue to expand their addressable market, they continue to integrate their existing portfolio, from both a technical and a licensing perspective. Customers are in turn confused about the capability and addressability of each vendor's solution. 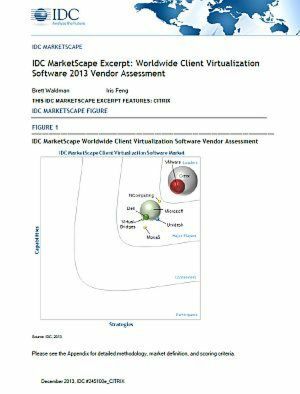 This IDC study represents the vendor assessment model called the IDC MarketScape. This research is a quantitative and qualitative assessment of the characteristics that explain a vendor's success in the marketplace and help anticipate the vendor's ascendancy. The study assesses the capability and business strategy of many client virtualization software vendors.